Wednesday night was meant to be a run then circuits…but I gave up after the run. :-O It was a good run, from the flat, around the bridges on the Clyde – up to Salt Market and back along the North side of the river to the Millenium Bridge at the BBC. We had a good strong steady pace from the start and maintained it right the way through. About 2-3 miles in I was wishing it was over, but I knew we only had about 1-2 miles left so just stuck in at it. It was a full moon, but it was dark and cold. As it’s along the Clyde the route is really flat and never really goes above 50m above sea level. I was running with my friend who has a recurring injury, but she felt strong and we both pulled each other along I think. We finished the distance at an 8:34 pace / 7.0 mph – around about my marathon pace. 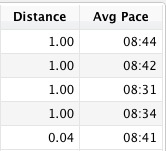 I need to do some more long runs at around about that pace (6.9 – 7.0 mph) to get my endurance up I think. And maybe some more runs on hills at that speed too. Run: 4.04 miles, 34:38, Pace: 8:34, 7.0 mph, Calories: 418. 340 mile challenge: 34.6 miles completed = 305.3 miles to go. 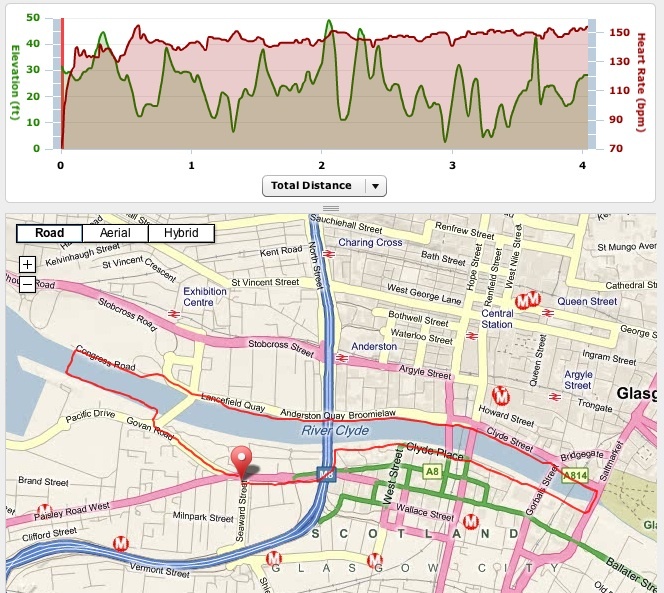 This entry was posted in Run and tagged 4, clyde, cold, dark, fast, miles, run, steady, winter. Bookmark the permalink.